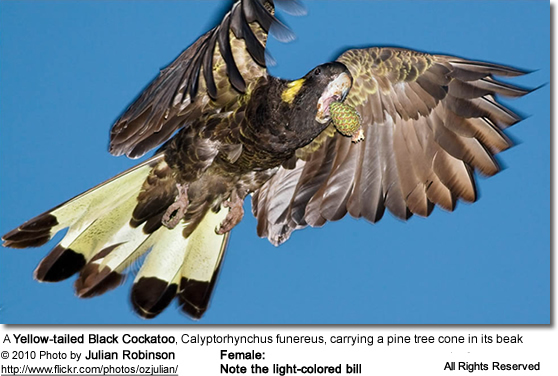 The Black Cockatoos (Yellow and White Tailed) are one of the largest of the cockatoo species and have dull black plumage. In the wild, the Black Cockatoo Inhabits the south eastern and south western corners of Australia and is mainly found in tall eucalypt forests and pine plantations. These birds are noisy and conspicuous and generally socialise in family groups. The Black Cockatoo has a need for attention that far outweighs any of the other cockatoo species, making this an extremely high maintenance bird and one that is generally not suitable as a pet. These birds are highly prone to stress in captivity and often become susceptible to behavioural problems such as feather picking and excessive screaming. 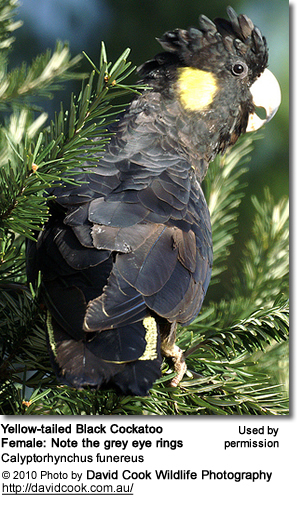 The Red Tailed Black Cockatoo, whilst still demanding a lot of attention, is far more desirable as a pet. 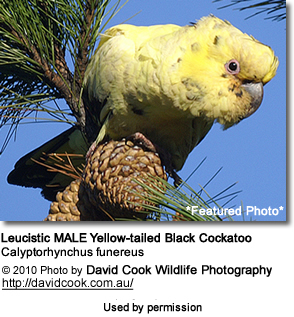 Like other cockatoos, this species is long lived. 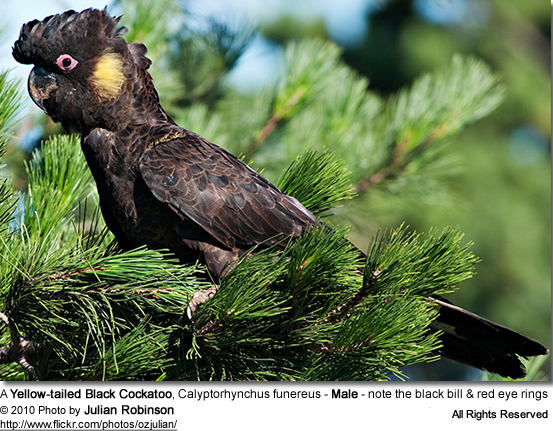 The Yellow-tailed Black Cockatoo, Calyptorhynchus funereus, is a large cockatoo native to the south-east of Australia and Tasmania. It is found from Eyre Peninsula to south and central eastern Queensland. In some places at least, they appear to have adapted to humans and can be often seen in many parts of urban Sydney and Melbourne. On mainland Australia, this species is found from the vicinity of Gin Gin and Gympie in south and central eastern Queensland, south through New South Wales, where it occurs along the Great Dividing Range and to the coast, and into and across most of Victoria bar the northern and northwestern corner, to the Coorong and Mount Lofty Ranges in southeastern South Australia. 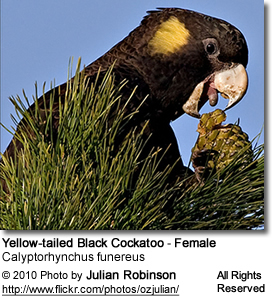 The Yellow-tailed Black Cockatoo also occurs on King, Flinders and Cape Barren islands. A tiny population inhabits the Eyre Peninsula (~ 30 to 40 birds). There they are found in Sugar Gum woodland in the lower peninsula and migrate to the mallee areas in the northern peninsula after breeding. There is evidence that birds on the New South Wales south coast move from elevated areas to lower lying areas towards the coast in winter. 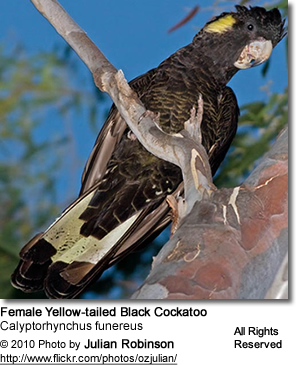 Despite their wide distribution, Yellow-tailed Black Cockatoos are usually only found in isolated populations throughout the country. Birds may be found in grassy woodland, riparian forest, heathland, subalpine areas, pine plantations and occasionally in urban areas - whereever food supplies are available. Although not particularly common, they are one of the most well-loved and characteristic birds of southern Australia. 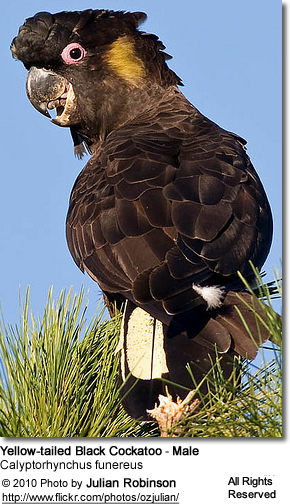 They are usually seen flying at only moderate height. They have particularly large wings and flap deeply, very slowly, and with a peculiar heavy, fluid motion. Their loud, eerie wailing calls carry for long distances, and the combination of sound and silhouette is unmistakable. 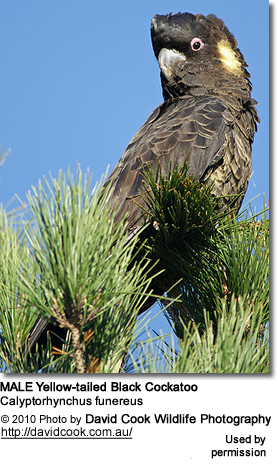 Adult birds are between 55 and 65 cm (22–26 inches) in length and weigh over 800 grams. 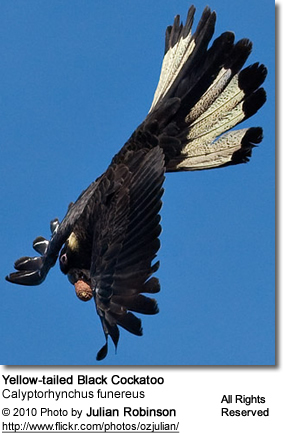 They are black overall with paler feather-margins and patches of pale yellow in the tail. The male bird has a black bill, a dull yellow patch behind the eye, and a reddish eye-ring. Females and immatures have a grey eye-ring, a light-colored bill, and a brighter, more clearly-defined yellow cheek-patch. Leucistic specimen are found in their natural habitat. This color deviation is caused by a melanin impairment, which causes the normal black coloration to be yellow. Leucism is often confused with albinism (= a complete absence of pigment). However, leucistics is caused by an impairment of pigment production. Their natural food is varied and depends mostly on what kind of foods are available within their large range -- which reduces their vulnerability to degradation or changes in habitat. But much of their diet comprises seeds of native trees, particularly she-oak (Casuarina) but also Eucalyptus, Acacia, Banksia and Hakea. They are very fond of the larvae of tree-boring beetles and cossid moths, and strip the bark from the trees and tear away at the wood to find them. 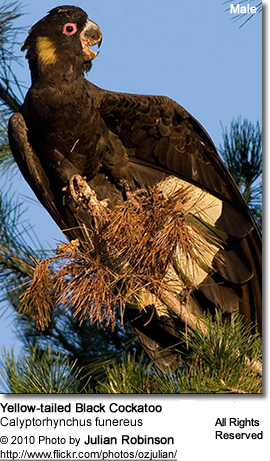 The yellow-tailed black cockatoos have a long breeding season. Both sexes construct the nest, which is a large tree hollow, lined with wood chips. The female alone incubates one or two eggs, while the male supplies the food. Usually only one chick survives, and it stays in the care of its parents for about six months. Nesting takes place in large vertical tree hollows of tall, usually isolated trees. The same tree may be used for many years. Hollows can be 1 to 2 metres (3–7 ft) deep and 0.25–0.5 metres (10–20 in) wide. The nest is lined with woodchips. A clutch consists of 1 to 2 white eggs measuring 49 x 36 mm. The incubation period in captivity is 28–31 days. Out of a clutch of two, usually only one chick survives and it stays in the nest for three months. After fledging, the parents continue to feed it for another three months. The species is rarely seen in aviculture. As this species is rare and at risk of extinction, every effort should be made to place any eligible captive yellow-tailed black cockatoos into a well-managed breeding program to ensure their survival. If individuals of this species are not good prospects for breeding for whatever reason and you are considering it as a pet, the following should be of interest.